A dense, sweet confection, familiar to the Middle East, North Africa and the Jewish world, Halva, usually sweetened by sugar or honey, is typically made with tahini or semolina. Israeli halva is made with tahini, ground sesame paste and mixed with sugar syrup, heated to 149 - 154 C /300 - 310 F, also known as the hard crack stage. Once mixed, flavours such as chocolate, vanilla and pistachio nuts are added. This type of halva is more crumblier in texture and almost always 'parve' as the only other ingredient added are the rootextracts of the Saponaria plant, making halva also a vegan dessert. Halva made with semolina or a grain flour is typically found in Asia, where honey, vegetable oil and nuts or dried fruits are added to the semolina. It has a slightly gelatinous texture, rather similar to polenta. Halwa is a popular vegetable based dessert in India and Pakistan, where root vegetables such as yam, beetroot or more commonly carrots, are mixed with mung beans instead of semolina and ghee to bind it all together, to produce a more moist but flaky confection. Halva can be eaten on it's own as healthy snack or sweetmeat after a meal with a cup of coffee. It can also be used in cakes as in Ottolenghi's recipe for halva and walnut cake, and is also delicious when made into ice cream. 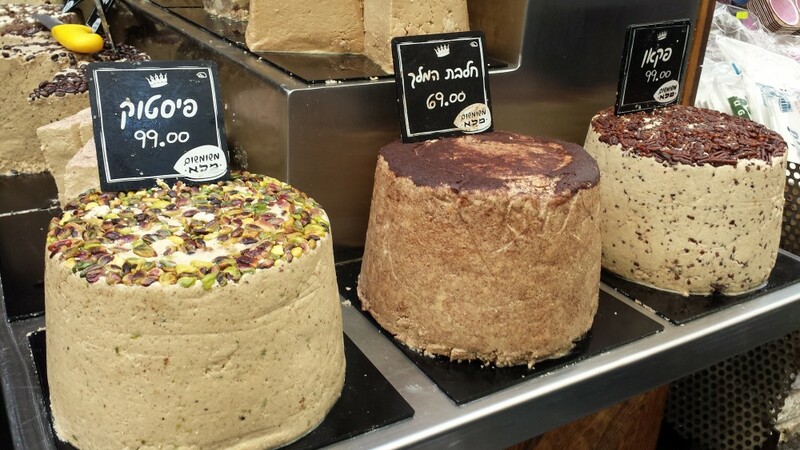 All over Israel you find market stalls and shops selling vast quantities of halva in large domes sold by the kilo or in shops packaged as individual blocks or snack bars of the different flavours. This is usually bought for relatives and friends as 'the taste of Israel'.